If you are gearing up to take courses to become a certified pool operator, it can be very helpful to start off by understanding the basics steps to opening a public pool. 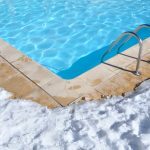 While the following information doesn’t cover everything, it serves as a starting point for pool management for opening a pool and code compliance. Let’s look at what many health inspection agencies include in their inspection of pools. In order for a pool to pass inspection, it needs to be built and marked correctly. There are state codes and industry standards that a commercial pool must comply with in order to be operable. The steps to opening a pool can start by checking the condition and design of a pool. First off, the decking around the pool needs to meet size and slope requirements. This helps reduce the risks of accidental slips and falls, as well as meeting occupancy needs. Next, the pool must have depth markings intact and in the proper locations. It is typical for depth marking requirements to be both on the coping and decking (in a slip-resistant format) in color contrasting colors. Also, the finish of the pool must be fully intact as to not pose a danger to bathers for abrasions and slips. All handrails, grab-rails, and ladders into the pool must be properly secured. Likewise, if a pool has a diving board, it must be secure, slip-resistant, and meet slope requirements for safe diving. However, even secure and properly diving boards must be treated with care when using. All underwater lights must be in the proper areas and must be in working order. Skimmers and gutter must be covered, have no protrusions, and the grate or lid must be fully intact. To continue properly opening a pool, you must also make sure has all required safety equipment. Industry standard requires that shepherd’s hooks are bolted and attached to a non-extendable pole and they are visible and in reach. Shepard’s hooks are life-saving devices that can assist active drowning victims. Commercial pools with lifeguards should have a ring buoy with an attached rope so it can reach all parts of the pool. Lifesaving rings must also be visible and accessible at all times. If a pool is required to have lifeguards then a rescue tube can be utilized instead of a ring buoy. Some states require a rope and floats separating the shallow end from the deep end. A transition line on the bottom may also be required as well. Pool skimmers need to have an intact weir in place and skimmer lids must be in place and secured properly. The weir prevents excessive debris from clogging the skimmer and acts is a backflow control; preventing water from escaping the skimmer compartment once it enters. Signage is also important at public pools. There is a variety of signage that should be present including bather rules, no diving, and no lifeguard on duty signs, in addition to caution chemical and no smoking signage in pump rooms and chemical storage areas. Signs should be clear, visible and easy to read. Well-balanced pool chemicals are imperative steps to opening a pool. There must be an approved test kit at the pool. This kit must be able to test chlorine or bromine, pH, calcium hardness, and total alkalinity. If needed, other testing capabilities should be available such as tests for cyanuric acid, salt tests, and tests for metals like copper. If the pool uses cyanuric acid, the levels must not exceed the amount specified by local health codes. In most cases, health codes cap the cyanuric acid limit at 100 ppm. However, this is not true everywhere. Sanitation is one of the most important aspects of pool operation. All sanitary facilities near the pool must have the right supplies and properly cleaned and maintained. The pool’s disinfection feeders must be in place and operating properly. If you are using electrical feed pumps, they must be electrically interlocked with the recirculation pump. Finally, when opening a pool, it must be clear of floating material, visible dirt as well as algae. Remember, these steps are just a starting point to opening a pool. In order to open a pool in the most comprehensive way, you will need to take courses in CPO certification. Pool Operation Management offers award-winning, two-day courses in CPO certification. We offer the perfect start to becoming a pool expert. We also offer residential and commercial pool maintenance services, so we can open your pool for you. Contact us today to get started.